Chalmers University of Technology (Swedish: Chalmers tekniska högskola, often shortened to Chalmers) is a Swedish university located in Gothenburg that focuses on research and education in technology, natural science, architecture, maritime and other management areas. The university was founded in 1829 following a donation by William Chalmers, a director of the Swedish East India Company. He donated part of his fortune for the establishment of an "industrial school". Chalmers was run as a private institution until 1937, when the institute became a state-owned university. In 1994, the school was incorporated as an aktiebolag under the control of the Swedish Government, the faculty and the Student Union. Chalmers is one of only three universities in Sweden which are named after a person, the other two being Karolinska Institutet and Linnaeus University. Beginning 1 May 2017, Chalmers has 13 departments. Furthermore, Chalmers is home to eight Areas of Advance and six national competence centers in key fields such as materials, mathematical modelling, environmental science, and vehicle safety. Chalmers University of Technology's research infrastructure includes everything from advanced real or virtual labs to large databases, computer capacity for large-scale calculations and research facilities. Approximately 40% of Sweden's graduate engineers and architects are educated at Chalmers. Each year, around 250 post graduate degrees are awarded as well as 850 graduate degrees. About 1,000 post-graduate students attend programmes at the university, and many students are taking Master of Science engineering programmes and the Master of Architecture programme. Since 2007, all master's programmes are taught in English for both national and international students. This was a result of the adaptation to the Bologna process that started in 2004 at Chalmers (as the first technical university in Sweden). Currently, about 10% of all students at Chalmers come from countries outside Sweden to enroll in a master's or PhD program. Around 2,700 students also attend Bachelor of Science engineering programmes, merchant marine and other undergraduate courses at Campus Lindholmen. Chalmers also shares some students with Gothenburg University in the joint IT University project. The IT University focuses exclusively on information technology and offers bachelor's and master's programmes with degrees issued from either Chalmers or Gothenburg University, depending on the programme. Chalmers confers honorary doctoral degrees to people outside the university who have shown great merit in their research or in society. 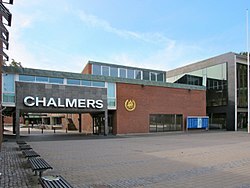 Chalmers is an aktiebolag with 100 shares à 1,000 SEK, all of which are owned by the Chalmers University of Technology Foundation, a private foundation, which appoints the university board and the president. The foundation has its members appointed by the Swedish government (4 to 8 seats), the departments appoints one member, the student union appoints one member and the president automatically gains one chair. Each department is led by a department head, usually a member of the faculty of that department. The faculty senate represents members of the faculty when decisions are taken. In 1937, the school moved from the city center to the new Gibraltar Campus, named after the mansion which owned the grounds, where it is now located. The Lindholmen College Campus was created in the early 1990s and is located on the island Hisingen. Campus Johanneberg and Campus Lindholmen, as they are now called, are connected by bus lines. Traditions include the graduation ceremony and the Cortège procession, an annual public event. Chalmers Aerospace Club – founded in 1981. In Swedish frequently also referred to as Chalmers rymdgrupp (roughly Chalmers Space Group). Members of CAC led the ESA funded CACTEX (Chalmers Aerospace Club Thermal EXperiment) project where the thermal conductivity of alcohol at zero gravity was investigated using a sounding rocket. Chalmers Alternative Sports - Student association organizing trips and other activities working to promote alternative sports. Each year arranges the Chalmers Wake a Pond wakeboard contest in the fountain outside the architecture building at Chalmers. XP - Committee that is responsible for the experimental workshop, a workshop open for students. Chalmers Students for Sustainability – [CSS] promoting sustainable development among the students and runs projects, campaigns and lectures. Chalmers has partnerships with major industries mostly in the Gothenburg region such as Ericsson, Volvo, and SKF. The University has general exchange agreements with many European and U.S. universities and maintains a special exchange program agreement with National Chiao Tung University (NCTU) in Taiwan where the exchange students from the two universities maintains offices for, among other things, helping local students with applying and preparing for an exchange year as well as acting as representatives. It contributes also to the Top Industrial Managers for Europe (TIME) network. A close collaboration between the Department of Computer Science and Engineering at Chalmers and ICVR at ETH Zurich is being established. As of 2014, Chalmers University of Technology is a member of the IDEA League network. In 2018, a benchmarking report from MIT ranks Chalmers top ten in the world of engineering education. Chalmers has also achieved the highest reputation for Swedish Universities by the Kantar Sifo's Reputation Index. In the 2011 International Professional Ranking of Higher Education Institutions, which is established on the basis of the number of alumni holding a post of Chief Executive Officer (CEO) or equivalent in one of the Fortune Global 500 companies, Chalmers University of Technology ranked 38th in the world, ranking 1st in Sweden and 15th in Europe. In the latest QS World University Rankings (2019), the university was ranked 128th in the world (overall). In the latest Times Higher Education World University Rankings (2018), Chalmers ranked 201-250 of all global universities. In the latest Academic Ranking of World Universities (2018), the university was ranked between places 201-300 of all universities in the world. Although the official Swedish title for the head is "rektor", the university now uses "President" as the English translation. ^ Facts and figures (English) Archived 23 May 2011 at the Wayback Machine. Chalmers.se. Retrieved on 9 August 2011. ^ "Chalmers University of Technology - Maritime & Supply Chain Management Education". www.edumaritime.net. ^ "New organisation from 1 May". www.chalmers.se. Retrieved 2017-05-02. ^ Statues of Chalmers University of Technology Foundation, paragraph 5 Archived 14 September 2008 at the Wayback Machine. Chalmers University of Technology. Retrieved on 9 August 2011. ^ "U.S. News Education: Best Global Universities 2018". ^ "The Global State of the Art in Engineering Education". MIT J-WEL. 2018-03-30. Retrieved 2018-11-14. ^ "Chalmers "a beacon for interdisciplinary education"". www.chalmers.se. Retrieved 2018-11-14. ^ "Rankings | Chalmers". www.chalmers.se. Retrieved 2018-11-14. ^ "International Professional Ranking of Higher Education Institutions". Archived from the original on 22 January 2009.